sharing about 'ufos', 'extra terrestrials', 'inter dimensional visitors' and any related 'non earth' experiences of our cosmos. who can see this group? ET (UFO) Disclosure Series: #2 - U.S. Colonel Exposed Roswell ET Crash inc. Survivors. U.S. Uses ET Technology and so do WE in our Computers! In this 2nd part of my series on ET Disclosure evidence I am going to share with you the outstanding work of Colonel Philip J. Corso, the now deceased U.S. Military Colonel who claims to have been part of the Roswell ET/UFO crash recovery, following coverup AND DECADES of reverse engineering of alien technology AND covertly passing on some of that technology to the world's largest corporations to be sold on as if they had invented it themselves! 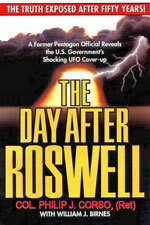 The first Part of this series is here and contains an interview with a US Military / CIA contractor who also confirms the reality of the Roswell crash and ET/Human Dealings. As a system engineer and technology designer, I am always interested in learning the finer points of the origins of what I am using on a daily basis. During my busy study years at university and subsequent years building software professionally, I never really delved fully into the full story of who exactly developed and created such technology as the Silicon microprocessor, Compact Discs and Fiber Optics. If I had of done, according to Colonel Corso, I would have hit a brick wall - because the real creators of these technology were not from Earth at all and the corporations who claimed to develop them were, in fact, receiving reverse engineered technology designs from secret projects that came under the control of the US Military. If I had not had several close up encounters with ET vehicles myself and experienced a variety of paranormal phenomena along with it - all within the vicinity of US airbases in Britain - then I might never have thought to dig deeper into this topic - even after hearing about Colonel Corso's message. I am glad though, that I have done and so far I have ONLY found corroborating testimony from others in the secret programs who decided to speak out, with nothing substantial that debunks the claims. This is probably the only book I can recommend that anyone reads who wants to know more about the reality of ET/human interactions that occurs in secret in military installations. I say that, not because I have read all of the others that exist, but because it is the only one I have ever heard of that was written by someone who was in a position of control within the military hierarchy at that time and which provides masses of details about what went on and why the decisions to cover up the whole thing were made as they were. He describes how the military recovered several small, humanoid beings from the crash site and how once the bodies of the dead were autopsied it was discovered that they were actually semi robotic beings that had printed circuit board type devices in parts of their brain cavity that allowed them to combine organic biological organs with computer like digital technology. Since this was in the 1940s, the humans involved had little idea what to do with what they were looking at. He described having many artifacts, including a laser device and fibre optic cabling, which they had no clue how to use and which took them years to understand. This is a book that I highly recommend to anyone who wants to know a highly probable alternative history for Earth's evolution and our technological path - best of all it's available for free here. Steven Greer of the Sirius Disclosure project interviewed Philip Corso Jr. about his Father and the events his father described in the following interview as part of his task of disclosing the reality of human/ET interactions to the rest of the world. In the following testimony, Mr. Corso Jr. reveals information he learned from his father including a meeting Col. Corso had with an extraterrestrial lifeform in Red Canyon, NM while Corso was commanding a missile battalion. Colonel Corso, Sr. discussed the ET issue with such people as President Eisenhower, Strom Thurman and FBI director J. Edgar Hoover as well as CIA leaders and several members of the Joint Chiefs of Staff. He said that much of this information was kept from multiple presidents including Carter. no comments yet... will yours be the first?